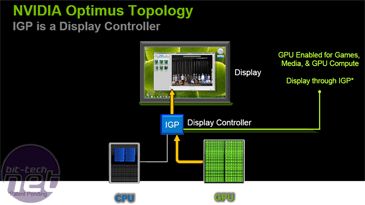 With all the kerfuffle about Fermi, it was a cryptic email from Cybertron Nvidia around CES time, about a new "thing" called Optimus. The inevitable Transformers jokes ensued in the office. It was a few weeks later that Nvidia invited us to a hotel in London to explain all. Expecting something along the lines of another rebrand, we didn't attend expecting much, however we came away seriously impressed. 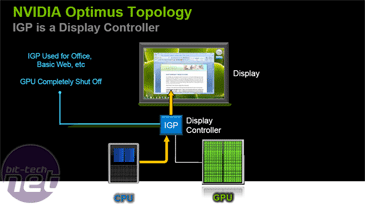 Optimus Technology is a laptop graphics technology that allows for switching between a discreet GPU and integrated graphics. Discreet GPUs - PCI-E cards from Nvidia or ATI offer more grunt, but at the heavy cost of power consumption and battery life, which is where integrated graphics shine. Granted, this isn't a new concept, but it's the execution of Optimus that's so promising. 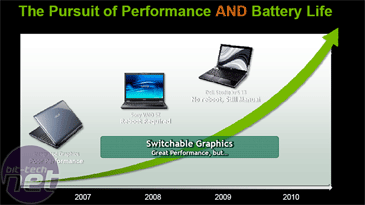 It seeks to build on the work that went into the now abandoned Hybrid Power technology which was was originally touted as a feature for desktop systems in 2008. While laptops with GPUs and integrated graphics have been around for several years, until now they've always relied on the user to toggle between the two - Optimus subtly shifts between the two without you even knowing. 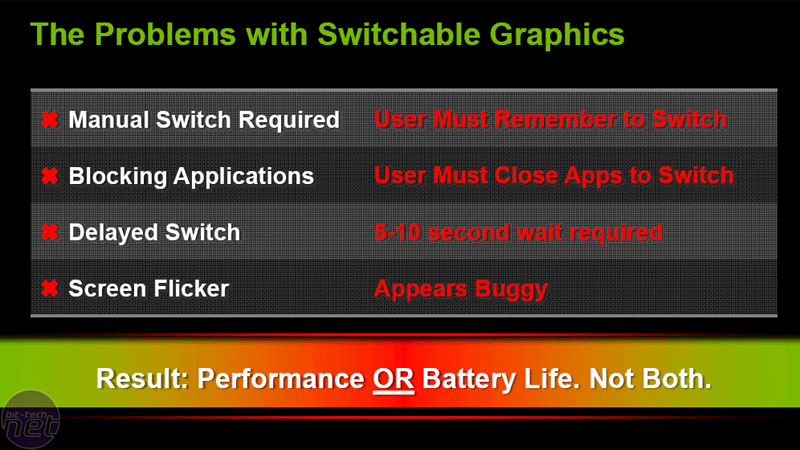 To date, switching the active graphics chip has either required a complete reboot, or finding the power options and changing them to "high performance" which also fires up the CPU to its maximum speed and again, requires a complete reload of the graphics subsystem. It takes time and it burns through your battery - you're not going to do it to play a quick round in a Flash game or edit a few photos. Nvidia demonstrated some research that claimed of those people who had additional graphics chips in their laptops, very few knew how to do the switcheroo, and even less - just 1 per cent of its sample - actually went to the effort of using it. Honestly, that's not unsurprising, because unlike you and I reading this most laptop users are not so well informed about technology; how to use it and when to use it, which means that if it doesn't work without thinking about it, it simply won't be used. Optimus is designed as a product in disguise and works completely autobotonomously in the background: it doesn't require you to manually change any software settings or flipping a physical switch. It fires up the GPU on an application by application basis. 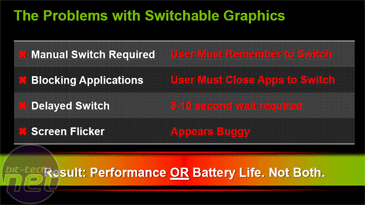 This application list can be edited or added to from Nvidia's control panel and it is designed to receive periodic automatic updates as well - "a bit like an anti-virus update" Nvidia told us. 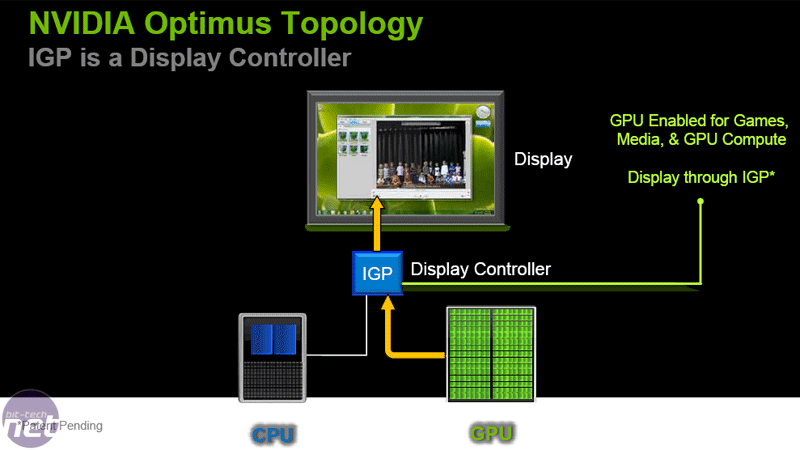 Nvidia's 'Optimus Routing Layer' sniffs out three of the following application call types: DirectX calls, DVXA calls and CUDA calls, and matches them to this kernel level library to know when it needs to fire up the GPU. 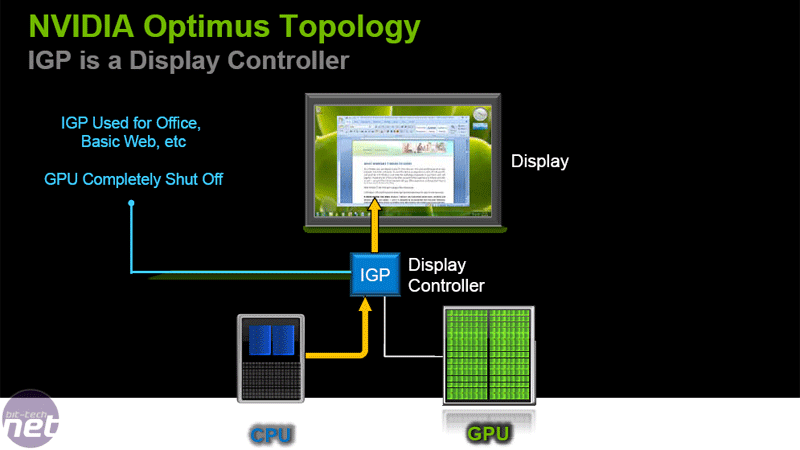 Nvidia demonstrated Optimus on a retail specification Asus UL50Vf laptop that's launching in co-operation with Nvidia's new technology. 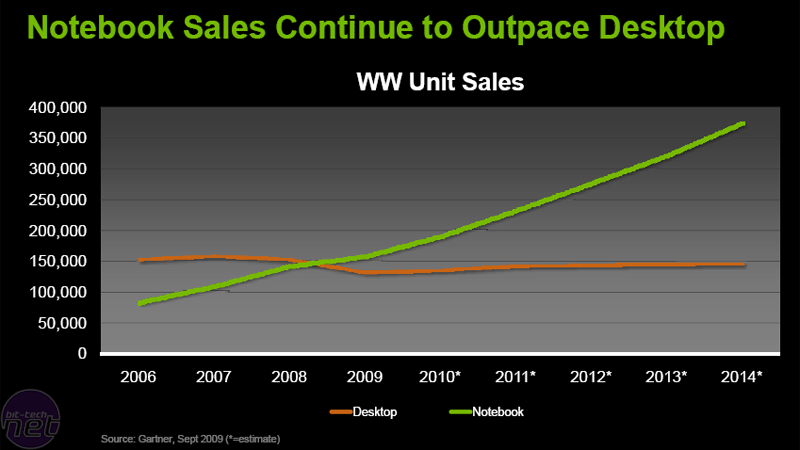 Nvidia claims over 50 design wins for Optimus by this summer, and expects to own the market of notebook products that feature additional graphics chips within the next 18 months, purely thanks to this technology. It's nothing if not ambitious. 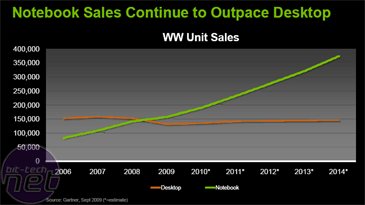 While we take the long term market share expectations with a pinch of salt we have no doubt Nvidia has its Optimus primed to create a considerable shockwave in the industry. 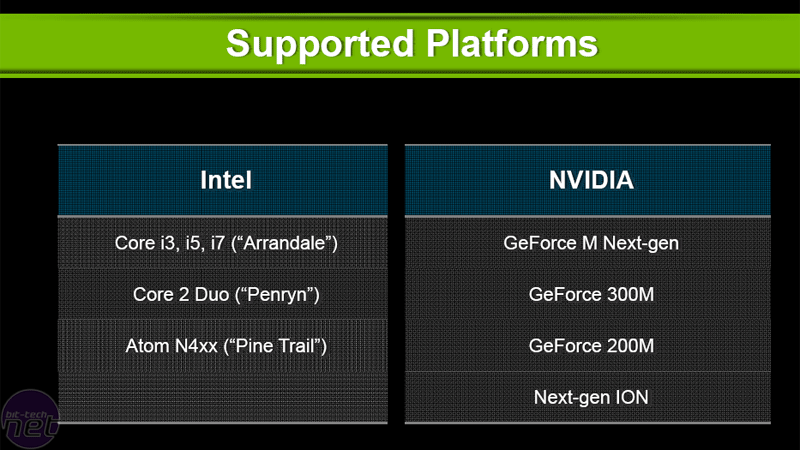 Success all hangs on Nvidia's future mobile graphics products though. 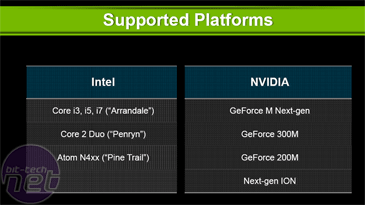 We're not alone in hoping for some brand new DirectX 11 hardware, and not having another repeat of the "GTX 260M = 9800 GT" scenario. That said, it will work with even existing GeForce and Intel technologies too, so there is some backward compatibility and hope for everything from ultra-thin CULV notebooks, to pineview netbooks, to desktop replacements featuring Core i7s and SLI.